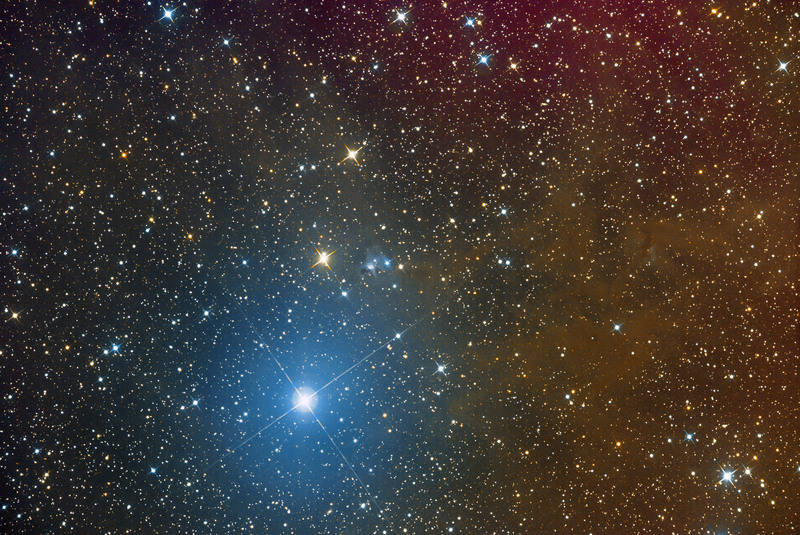 VdB 64 is a reflection nebula visible in the constellation Lepus. It is located about 20 arc minutes in the direction ENE from the 3.71 magnitude star η Leporis (the brightest star on the image, see mouseover). The nebula appears as a bluish gas spot surrounding a star of 10,68 magnitude and a small open cluster of young stars. The distance to the nebula is estimated at about 425 parsecs (1386 light-years) and thus it comes to be physically located on the edge of the super-bubble known as the Eridanus Bubble. The expansion of this super-bubble has caused the triggering of phenomena of star formation in all of the surrounding clouds. In fact VdB 64 contains seven stars of pre-main sequence, 4 of which are T Tauri stars, a sign that the star formation phenomena have been active in the astronomically recent past. The cloud is also surrounded by soft gas filaments detectable in Hα band.